Negotiation Free Mercedes-Benz Dealership in Wappingers Falls. Since 1919, the Curry Automotive Group has served the greater Hudson Valley and helped make their high-end vehicle dreams a reality. 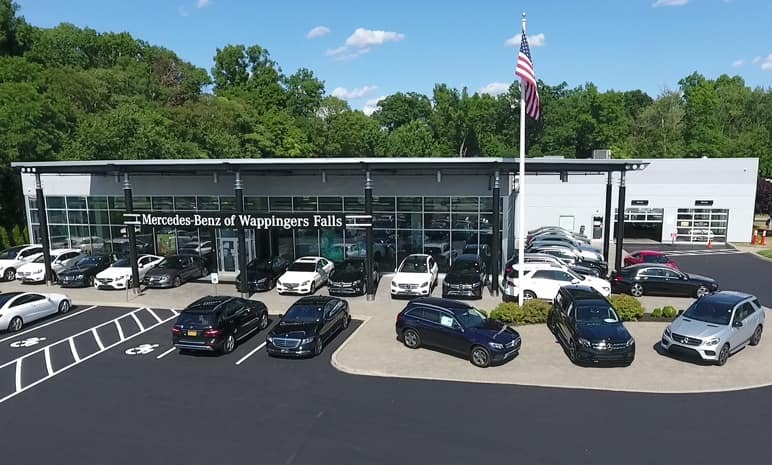 Mercedes-Benz of Wappingers Falls became a proud part of that legacy and continues to provide each customer with a top-notch car buying experience from beginning to end. It is our goal to create lifelong relationships with each and every one of our customers, as well as show our ever-lasting commitment to our community. As a family-owned dealership paired with tenured team members and a reputation for doing things the honest and fair way, we hope you’ll give us the privilege to earn your business, too. Whether you are in the market for a new Mercedes-Benz or a vehicle from a different manufacturer altogether, our team can assist you through the entire car buying process. Our lot features an impressive inventory so, you will have an abundance of choices available to you! Our dedicated team is happy to provide customers from the Wappingers Falls, Newburgh, Poughkeepsie, and Orange Lake, NY areas with an outstanding and completely transparent car buying experience! We understand you do not need to be a great negotiator to drive a bargain. That’s why when you choose us there will be no haggling, hype, back and forth, pressure, gimmicks, or surprises. It’s simple, we want you to experience the difference, from pricing and financing to service and experience. So don’t waste your time on negotiations, instead, stop into Mercedes-Benz of Wappingers Falls today and start enjoying your car buying experience. After you have started your search, be sure to stop by our specials page and look to see what new and used car specials we are currently running at Mercedes-Benz of Wappingers Falls. Our offers are updated on a monthly basis and can help keep the cash in your pocket when buying a new vehicle. If your vehicle needs to be serviced, stop by our service specials page to keep your vehicle in tip-top shape year-round. Browse our specials and stop in to see us or give us a call at 845-298-0600 to set up an appointment! Our team is ready to make your dreams a reality behind the wheel of a new ride!